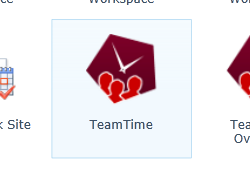 TeamTime is a time-tracking site for SharePoint. It allows users to log their time using either a standard timesheet, or by punching in and out on tasks. In addition to this, it gives managers the ability to analyse and report on the aggregated data by using the integrated versions of our own PivotPoint and FilterPoint web parts (included in the TeamTime license). Each TeamTime site should contain around 10-50 users, with a maximum of 100. This is limited by the frequency of archiving: 100 users would require archives to be run roughly every 4 weeks; this would be very inconvenient from an Analysis point of view. Read more about capacity guidance and organising your TeamTime sites here. 1. Download the appropriate installation file and run from any SharePoint Web Front End (WFE) server. See Installation for further information. 3. In your new site go to the Settings page, under the Administration heading. The default settings are fine here, but it's important you choose early on how users will enter their time. For more information see the 'Time Entry' explanation on the Settings manual page. 4. Go to the Projects page under the Administration heading. Here you can add and edit the Projects and Tasks your users can assign time to. For more information, see the Projects/Tasks manual page. 5. Finally, if you want other users (other than yourself) to be able to approve timesheets, you will need to grant them sufficient permissions. For more information, see the Permissions manual page.